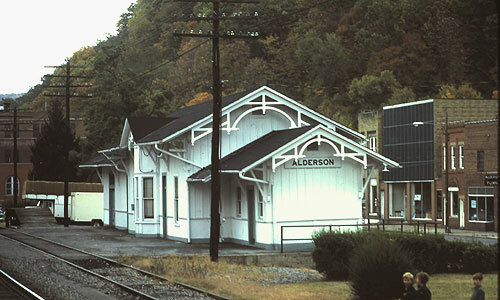 1 C&O Plaza at Railroad Ave.
On December 4, 2001, Alderson Station was eliminated from Amtrak Timetables. 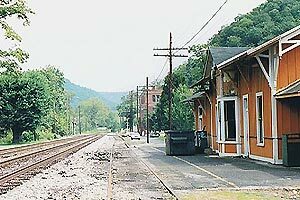 The flag station, Alderson, was located between Hinton and White Sulphur Springs on the route of Cardinal (Chicago - Cincinnati - Washington, DC). 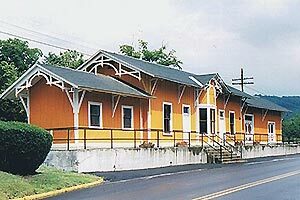 When I visited the station on Aug. 30, 2001, paint job had just finished. 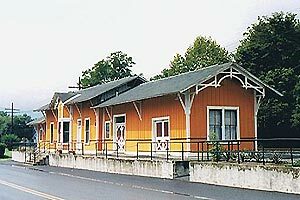 Although Cardinals (train #50 and #51) are still operated, the trains don't stop at the new orange-painted station. I hope the trains will stop there again. Alderson came back to Fall 2002 / Winter 2003 Amtrak Timetable. Although the departure time isn't listed yet, it will resume operation soon. Alderson is still listed on Fall 2003 / Winter 2004 Amtrak Timetable. However, Cardinals don't stop at this station yet. I don't know why. 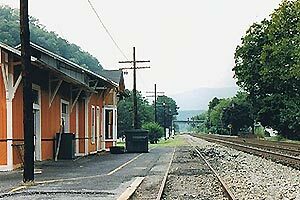 Does anybody have information about Alderson Station's future? Cardinal began stopping at Alderson in Fall 2004. It took very long time, but the station came back to normal. Alderson is still a Flag Stop Station.